Just added a new page of long necked, longer brimmed women's sunbonnets. Just testing out the response of these bonnets, but currently a few are availble. Each bonnet is labeled with information that will be of value to re-enmactors and the like concerning period correct-ness. While each bonnet is period correct in design, not all are if the pattern or material used is modern. These are the new denim jacket embroidered denim shirt and denim jacket appliques. I started making several and testing how they would look wh en sewn on a garment. If push came to shove, my favorites are the most colorful ones done on black. Some have been embroidered on denim and what is so much fun doing that is each piece of denim (because of weights and dye processes) are different. 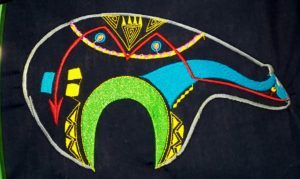 I decided that the two I sewed on lighter weight material will go great on a lightweight shirt, but from now on, all the zuni bear applique patches will be sewn on denim or a lighter weight black canvas. Not only will this make the patches more durable in the long run, but the dark color will give excellent contrast to the vibrant colors of these bears. My sister got this old style bonnet from an estate sale or something of that nature. I thought it was intriguing enough for me to play with and see if I could make a pattern from it. This was fun… Though simple, I still had not ever made a pattern from something that was already made without tearing the item apart. It meant throwing away my first experiments. I would consider this a period correct bonnet not only in it's design, but because I also use homespun cotton. 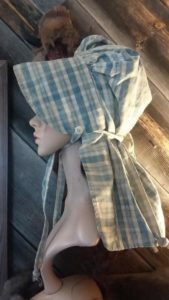 Homespun is a bit rough and scratchy to the touch but if you are a re-enactor and looking for something that is authentic, these period bonnets would work for just that purpose. I will try to post this after looking to see if all the photos I took are clear, then add info on how I did this bonnet. At some point, I would like to see about tweaking the pattern again so that there is a choice of the longer brim that I made and a shorter one as well as making the cap a bit fuller. I would like to try to use the same pieces and maybe make the brim smaller, mabye the back cap more gathered. However, when I showed my sister the end result, she preferred the result I came up with rather than the original. All a matter of taste 🙂 This was fun though ! !